…I mean, I haven’t EVER been this excited about lip balm! Earlier today — when I was formulating this new creation — I knew right away that I had to share the recipe with you. And trust me when I say that this is the smoothest, most nourishing chocolate lip balm you’ll ever try. *Yields approximately 10 standard lip balm tubes. 1. Using a small kitchen scale, measure out the Sweet Almond Oil, Shea Butter, Cocoa Butter, and Beeswax. Please note: Feel free to substitute Coconut or Olive Oil for the Sweet Almond. Click this link to purchase bulk organic carrier oils. 2. In a double boiler — or small pot — heat the first 4 ingredients over very low heat until melted. 3. Add chocolate. Stir mixture until completely melted, well combined, and liquid. 4. Remove from heat and whisk in vegetable glycerin, powdered sugar, and natural vanilla oil until mixture is smooth. 5. Pour into standard lip balm tubes. These make amazingly unique gifts! -Mountain Rose Herbs…they have everything you’ll need for this project! It’s your one-stop-shop! –The Bulk Herb Store also carries a few of these ingredients if you’d like to price check. 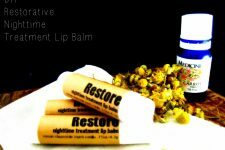 I do have these lip balms ready and available for purchase in my Etsy Shop. You can see the listing by clicking this link. 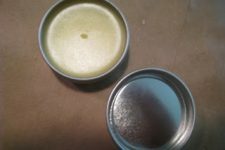 I just made chocolate peppermint lip balm the other day and its amazing! I sold out of it immediately! 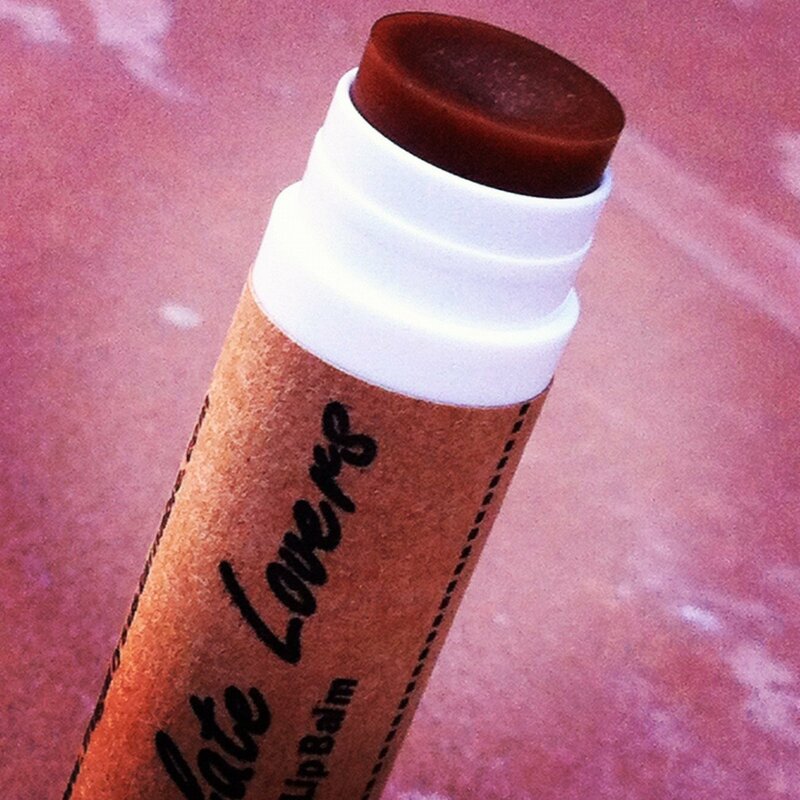 You can’t go wrong with chocolate lip balm! Thanks for sharing this delicious recipe! It’s the truth Nancy:) Good enough to eat! I’ve always wanted to try to make my own lip balm. This looks like the receipe to try! Yumm! It absolutely is Mary Beth! Try it…you will LOVE it! Is the powdered sugar used to sweeten the chocolate or used as a binder of sorts? Can it be omitted or must it be replaced with something (like potato starch or raw powdered cocoa?). I am sugar free – even in skin products. Thanks! No vitamin E? Do you know the shelf life? No vitamin E in this one:) But feel free to add a bit if you’d like. As for the shelf life without the vitamin E…I base it on the shelf life of the ingredients. Therefore, I estimate it to be 6-8 months. Does this color your lips? Yes there is a very slightly tint…just beautiful! Hi Andrea, I just wondered what the vanilla oil is? I saw it in another recipe but just wondered if I can use vanilla extract? Or is it vanilla essential oil? Thanks for your help! This recipe looks amazing, can’t wait to try it! Ok great! Thanks! Also I noticed you measured the oils and butters in .5 ounces but my scale does not measure amounts that small. Do you have the amounts in teaspoons? I know it is more accurate to do it on a scale but like I said, mine won’t weigh anything that light… Thanks again! Is it ok to put the glycerin in it? I wonder if it would shorten the shelf life since it’s water based? Any separation out issue? Thanks Amanda, definitely a Christmas gift idea! Thanks so much for all your recipes and great ideas, you’ve been a wealth of inspiration to me! what can i subsitute for almond oil? im allergic. coconut oil would be really yummy in this, but I think you could use any oil you want- olive, grapeseed…..
What I’ve understood is that it only pulls from the skin if there isn’t enough moisture in the air to draw from…. Use it during the wetter months, I guess? I just stumbled across your blog and wanted to let you know how great I think it is! Thank you so much for sharing! About how many chapstick tubes would this recipie use? Anyone? This sounds great for stocking stuffers for the kids. Have looked through all the old posts I saved. Didn’t you have a template with which to print the type of lip balm on the container?